You asked for it – we answered! 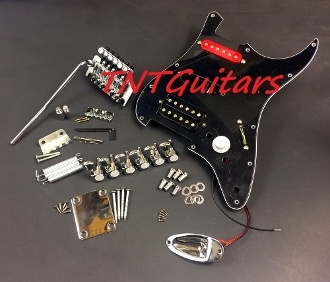 Here’s a kit for all of you out there wanting to put together a unique, yet classic, guitar. Everything we offer for this particular kit in one convenient package. Grab your wood, reflectors, and other miscellaneous accessories to get started! Be sure to click on the “Related Items” links below for more detailed component information. Check your measurements and ask any questions before you buy. --Prepared/shipped intact - cut it up! --Dirty it up to get your “aged” look! Buyers assume all risk of use; sales are only offered to those competent to safely and lawfully purchase and use items. Please know your abilities, requirements, measurements and needs to make sure this kit will work for you. Variability is to be expected as measurements provided are approximations. Depending on your system or set-up, modifications may be needed. Allow and expect variation in color due to photo and monitor settings, perception, lighting, as well as natural product variance. Color descriptions indicate color, not material. Diagrams/instructions NOT INCLUDED. Due to the vast and varied nature of possible set-ups and user expertise, we do not provide specific information for every possible installation scenario. Installation requires soldering and compatible system. Note that we do not recommend installation using power tools as these can put too much force on the product and cause damage. Installation is best with moderate heat only (don’t have your iron too hot). Pay attention during install to avoid damage. Excessive or prolonged heat can cause irreparable damage. Inspect your order upon receipt. We will address any issues PRIOR to installation. Installation, modification, or use in any way of any item in the kit invalidates the possibility of a return. Ask any questions regarding options, measurements, installation, requirements, special requests, etc. prior to purchase.